A 50 year veteran of the agro-commodity industry with professional experience in the executive management of business operations within the plantation tree crop commodity sector. 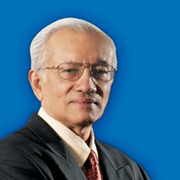 Having served for 35 years, he retired as Director of Franco-Belgian multi-national, SOCFIN Company Berhad in 1996. He was the start-up Chief Executive of the Malaysia Palm Oil Association (MPOA) and served this umbrella entity tasked with the function of balancing the needs and interests of the various sectors for synergy and development of the Malaysian plantation industry, from 1999 to 2005. He was involved in the formation of Roundtable on Sustainable Palm Oil (RSPO) in 2003 with the objective of promoting the growth and use of sustainable palm products through credible global standards & engagement of stakeholders. Appointed as the Chairman of the first RSPO meeting in 2003, elected as a Vice-President during 2004/2005 term and currently the Advisor to RSPO. Over the years he has held responsible positions in commodity sector forums and continues to serve the industry in an advisory and consultancy capacity to various business ventures and trade associations, at both regional and international level. He also serves on the board of number of plantation, renewable energy and commodity related companies in Malaysia, Indonesia, India and Sri Lanka. A graduate of the University of Adelaide in Agricultural Economics and Technology, he has been honoured with the Fellowship awards of the Incorporated Society of Planters(FISP), the Malaysian Oil Scientists' & Technologists’ Association (FMOSTA), the British Institute of Management(FBIM), The Malaysian Institute of Management(FMIM) and is an Honorary Member of RSPO.